This section of the Wild Atlantic Way takes you to the famous Ring of Kerry on a looped cycling route from the tourist hub of Killarney. This awe inspiring coastal cycling tour takes in pretty villages such as Sneem and Waterville, as well as beautiful stands such as Rossbeigh beach and the manicured Victorian gardens of Muckross Park, just outside Killarney. For the first three days you will be cycling along the southern coast of the Iveragh Peninsula with the Beara Peninsula across the water on your left and the Macgillycuddy’s Reeks on your right. This mountain range is home to 9 of the 10 tallest mountains in Ireland; the tallest of all being Carrauntoohil (1038m). From the town of Waterville you will be able to spot the famous Skellig Islands, the spectacular site of a 6th century monastic settlement and UNESCO World Heritage Site. 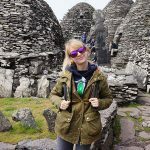 Reaching the coastal town of Portmagee you will have some time to explore Valentia Island, the site of the first permanent communication (telegraph) link between Europe and the United States. The second half of this Wild Atlantic Way cycling tour will see you making your way back to Killarney across the more rural and flatter Northern side of the peninsula, passing towns such as Portmagee, Glenbeigh and Killorglin, home of the traditional Puck Fair. You will have views of the stunning Kerry coastline including the Dingle Peninsula, Rossbeigh and Inch beaches to your left. We have designed this Wild Atlantic Way cycling tour so you will stay in all the most important towns along this stunning route and with short cycling days, so you will have time to explore the history and heritage of along the way. 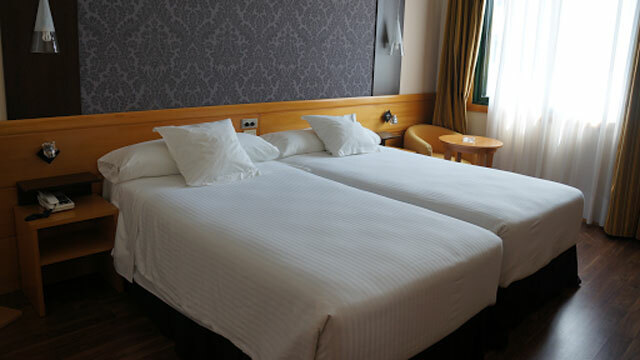 You will start your Wild Atlantic Way cycling holiday in the popular tourist town of Killarney where you can explore its many restaurants, cafés and heritage sites, all within walking distance of your first night’s accommodation. 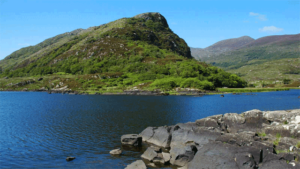 On the first day of your Wild Atlantic Way cycling tour you will leave the bustling town of Killarney via the beautiful Killarney National Park. Muckross House and Gardens will be on your right (it is possible to take a short detour through the estate). You will be gradually gaining altitude as you climb to the highest point of your trip through Molls Gap, where there is a conveniently located café (open March to November). Your descent from Molls Gap will be quite effortless, free wheeling most of the way to your accommodation in Kenmare, a bustling and pretty town home to great food. 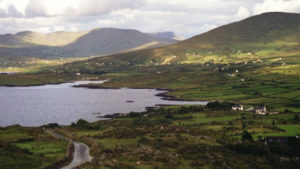 The Wild Atlantic Way takes you from Kenmare to Caherdaniel today along relatively flat and well maintained roads; with ocean views and a selection of small islands including Rossmore, Sherky and Scariff to your left. 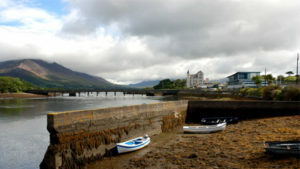 You will be passing the lively tourist town of Sneem on the way to your accommodation for the evening in Caherdaniel. Leaving the village of Caherdaniel this morning you will climb steadily until you reach the viewing point at Coomakista where you can take in panoramic vistas of Scariff Island, Valentia Island and the Skellig Islands. From here, the Wild Atlantic Way route takes cyclists downhill all the way to the town of Waterville, with the beautiful Lough Currane on your right. Lough Currane is 2 miles wide and 3 miles long and is famous for its salmon and sea trout fishing. The cycle from Waterville to Portmagee will once again be coastal, along the edge of sandy beaches such as Reenroe and Ballinskelligs. From Ballinskelligs to Portmagee the area is more exposed to the elements and the power of the Atlantic Ocean with sandy beaches making way to rocky sea cliffs. Your accommodation in Portmagee is a short walk from Valentia Island. Cycling from Portmagee to Glenbeigh, this stretch of the Wild Atlantic Way cycling tour will be fairly flat along good quality roads, with stunning vistas of the Dingle Peninsula and the Atlantic Ocean to your left. You will find viewing points dotted at key locations along the route, allowing you to get off the road and take pictures safely. 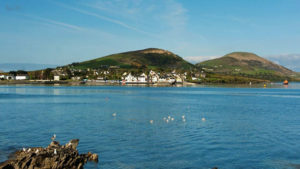 The market town of Cahersiveen is a nice place to stop for a coffee or a treat before continuing on your journey. Between Cahersiveen and Glenbeigh, the Ring of Kerry moves away from the coast taking you to a low level mountain pass for a few kilometers, before linking up with the coast once more as you descend into Glenbeigh, your stop for the evening. The first half of today’s journey between Glenbeigh and Killorglin will be on flat good quality roads. Killorglin is best known for hosting the traditional ‘Puck Fair’. This three-day event which is held in August, is the oldest fair in Ireland, dating back over 400 years. Leaving Killorglin you will cross the River Laune and follow a well paved road, lined with traditional hedgerows parallel to the river. You will soon be in Killarney, where you can indulge in a well deserved drink and a celebratory dinner this evening. Explore the many restaurants, cafés and heritage sites Killarney has to offer. Meander the streets of Killarney or if the weather is nice, visit the beautiful lakes and take a stoll in the national park to visit Muckross House and Torc Waterfall. Today is the end of your Ring of Kerry adventure. 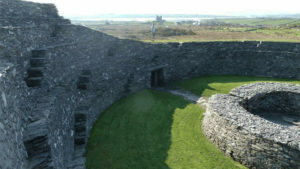 Kerry Airport to Killarney | Taxi | Travel time 0H20, taxi rank outside main terminal | Fare €30 approx. Kerry Airport to Killarney | Bus Éireann No.285 | Travel time 0H30 outside the main terminal every 2 hours | Fare €9 return approx. Step 1: Cork Airport to Cork City | Bus Éireann – Bus No.226A | Travel time 0H20, leaving every 30 minutes. Step 2: Cork City (Cork Kent Station) to Killarney | Irish Rail | Travel time 1H15, leaving every 2 hours | Fare €40 return approx. Step 2: Cork City (Cork Kent Station) to Killarney | Bus Éireann No.40 | Travel time 2H, leaving every 2 hours from mid morning to mid day | Fare €40 return approx. Dublin Airport to Killarney | Bus Éireann | Travel time 6H15 leaving Dublin Airport every 2 hours from mid morning to evening | Fare €50 return approx. 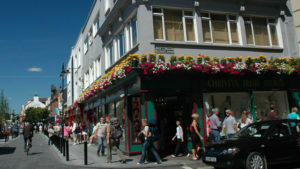 Step 2: Once on O’Connell Street it is a short walk, tram or taxi ride to Heuston Train Station, Busaras Bus Depot or Burgh Quay. Step 3: Dublin City Centre (Heuston Train Station) to Killarney | Irish Rail | Travel time 3H15, leaving every 2 hours | Fare €40 return approx. Step 3: Dublin City Centre (Busaras Bus Depot) to Killarney | Bus Éireann | Travel time 6H15, leaving every 2 hours from morning to mid day | Fare €50 return approx.